Over the past two years, momentum has been building behind a new approach to social issues in St. John’s and throughout Newfoundland and Labrador. Across governments, community organizations, and business there has been a push to explore new ways to tackle complex social and economic challenges. It is clear that creativity, collaboration and innovation are key to unlocking new opportunities for our economy while building more vibrant and inclusive communities. In particular, there is a shift across sectors and across the labour market towards leveraging social enterprise as a sustainable business model to create social change. Choices for Youth has been a part of this shift. For over eight years, we have been operating social enterprises in St. John’s to train and employ at-risk and homeless youth. Our social enterprise portfolio includes operations in the construction, manufacturing and retail sectors. We have first-hand experience starting and growing sustainable businesses — all with a mandate to train and employ vulnerable youth while providing a range of supports they need to succeed in the workplace. As practitioners, we have accumulated a vast amount of experiential knowledge on what it means to build social enterprises in Newfoundland and Labrador. This white paper analyzes the current national social enterprise landscape and explores the opportunities and challenges in our provincial context. 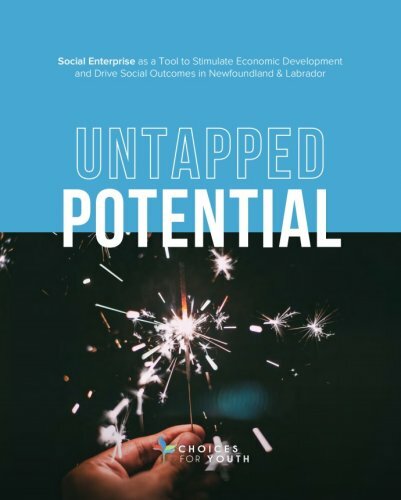 Sharing insights on the social and economic value of social enterprises through the analysis of policies, best practices and academic research from across the country offers key recommendations to build a thriving and social enterprise ecosystem in Newfoundland and Labrador.